Tetrahydrogestrinone(often referred to as THG or The Clear) is an anabolic steroid developed by Patrick Arnold. It has affinity to the androgen receptor and the progesterone receptor, but not to the estrogen receptor. The drug has been considered a designer drug, closely related to the banned anabolic steroids gestrinone and trenbolone, and was referred to as an unapproved new drug by the Food and Drug Administration (FDA) in 2003 before the subsequent scheduling of it in 2005. A synthesis was devised to ensure a source of material for comparison. Structure-activity relationship studies report that the potency of the drug is outstanding, surpassing, on a milligram per milligram basis, every known synthesized or commercial available anabolic steroid at the time of its development. It is a highly potent agonist for the androgen and progesterone receptors, around 10 times more potent than the comparison drugs nandrolone or trenbolone, but with no estrogenic activity. It has been found to bind to the androgen receptor with similar affinity to dihydrotestosterone and produces growth of muscle tissue. According to Patrick Arnold, due the drug's potency, he never had to supply significant quantities to BALCO, because "just a couple of drops under the tongue" were a sufficient dose. When THG reaches the nucleus of a cell, it binds to the androgen receptor at the ligand-binding pocket. Here it changes the expression of a variety of genes, turning on several anabolic and androgenic functions. It is the ligand’s structure which determines the number of interactions that can take place with the human androgen receptor ligand-binding domain. Even minor modifications in the ligand's structure have a great impact on the strength of the interactions this ligand has with the androgen receptor. THG, possessing a high affinity, establishes more van der Waals contacts with the receptor than with many other steroids. It is this higher affinity and specific geometry of THG which makes these interactions with the Androgen Receptor so strong, resulting in THG’s potency. Side effects from prolonged use are likely to include infertility in both men and women, as well as other steroid side effects such as acne and hirsutism. Unlike most other anabolic steroids, THG also binds with high affinity to the glucocorticoid receptor, and while this effect may cause additional weight loss, it is also likely to cause extra side effects such as immunosuppression that are not seen with most other steroids. For a time, THG was considered the drug of choice for safe and "invisible" world record breaking in athletics, being used by several high profile gold medal winners such as the sprinter Marion Jones, who resigned from her athletic career in 2007 after admitting to using THG prior to the 2000 Sydney Olympics, where she had won three gold medals. It has also been used by formerly banned British athlete Dwain Chambers and Major League Baseball first baseman Jason Giambi. THG was developed by Patrick Arnold for the Bay Area Laboratory Co-operative (BALCO), an American nutritional supplement company. The company manufactured the drug through palladium-charcoal catalyzed hydrogenation from gestrinone, a substance used in gynecology for treatment of endometriosis (Australian Medicines handbook 2011). In 2003, U.S. sprint coach Trevor Graham delivered a syringe containing traces of THG to the United States Anti-Doping Agency (USADA). This helped Don Catlin, MD, the founder and then-director of the UCLA Olympic Analytical Lab, to identify and develop a test for THG, the second reported designer anabolic steroid. ^ a b "Video". CNN. 2006-10-09. Retrieved 2010-05-25. ^ a b Death AK, McGrath KC, Kazlauskas R, Handelsman DJ (May 2004). "Tetrahydrogestrinone is a potent androgen and progestin". J. Clin. Endocrinol. Metab. 89 (5): 2498–500. ^ Labrie F, Luu-The V, Calvo E, et al. (February 2005). "Tetrahydrogestrinone induces a genomic signature typical of a potent anabolic steroid". J. Endocrinol. 184 (2): 427–33. ^ Jasuja R, Catlin DH, Miller A, et al. (October 2005). 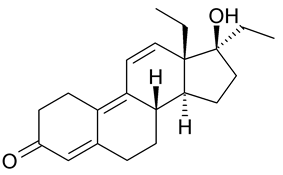 "Tetrahydrogestrinone is an androgenic steroid that stimulates androgen receptor-mediated, myogenic differentiation in C3H10T1/2 multipotent mesenchymal cells and promotes muscle accretion in orchidectomized male rats". Endocrinology 146 (10): 4472–8. ^ Kicman AT (June 2008). "Pharmacology of anabolic steroids". Br. J. Pharmacol. 154 (3): 502–21. ^ Thevis M, Schänzer W (2005). "Mass Spectrometry in Doping Control Analysis". Current Organic Chemistry 9 (9): 825–848. ^ Friedel A, Geyer H, Kamber M, et al. (June 2006). "Tetrahydrogestrinone is a potent but unselective binding steroid and affects glucocorticoid signalling in the liver". Toxicol. Lett. 164 (1): 16–23. ^ "Jones pleads guilty in drug case". BBC News. 2007-10-06. Retrieved 2010-05-25. ^ Fainaru-Wada, Mark; Williams, Lance (December 2, 2004). "Giambi admitted taking steroids". San Francisco Chronicle. Retrieved May 25, 2007. ^ http://www.usatoday.com/sports/olympics/2007-02-28-catlin-drug-lab_N.htm USA Today, 28 February 2007. See instead (modulators of 20,22-desmolase, 17α-hydroxylase/17,20-lyase, 3β-HSD, 17β-HSD, 5α-reductase, and aromatase).